Almotamar.net - The value of tourism resulting from spending by tourists visiting Yemen from different parts of the world during the year 2009, in addition to one-day visitors raised to $903 million, achieving by that an increase by 6% compared to 2008. Depending on recent official Yemeni statistics the volume of tourism coming to Yemen in the last year amounted to 1.028.127 tourists, the Yemenis living abroad formed 57% of the number of tourists of the last year. General indicators of the tourist movement in Yemen in 2009 revealed an increase in the volume of tourists by 7%, compared to 2008 and a slight drop in the number of visits of the Yemenis living abroad amounted to 4%. According to the Tourist Statistic book, Almotamar.net got a copy of it; tourists to Yemen from the Middle East amounted to 296.906, forming 68% of the total number of foreign tourists. The number of tourists from Asia amounted to 50.171 tourists, forming 12% of the total number of tourists to Yemen, recording an increase by 31% compared to 208. According to the book on tourist statistics 43.493 European tourists visited Yemen registering 10% of the total number of tourists in 2009 with an increase by 23% compared to 208. The number of African tourists visited Yemen in 2009 amounted to 16.418 tourists, i.e. by 4% of the total number of tourists last year, with an increase of 52% compared to 2008. 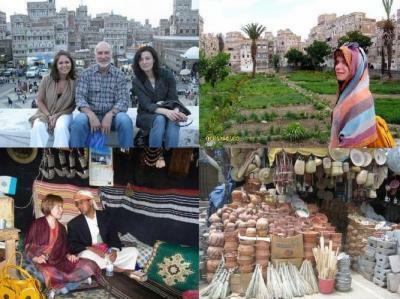 Tourists visited Yemen from the two Americas in 2009 mounted to 25.493 tourists, with an increase by 41% compared to 2008. Visitors for tourism in Yemen from the United States of America came in the first place in number registering 77% of the total number of tourists from this region.